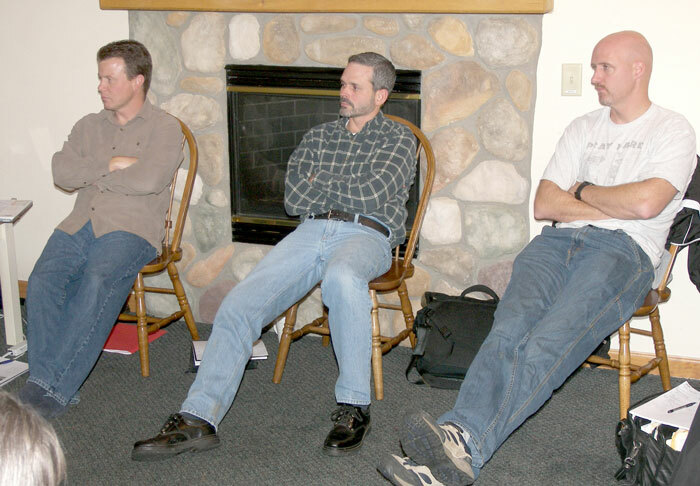 L-r: Bishop Ron Ramsey, Gary Dilley, and Howard Matthews. 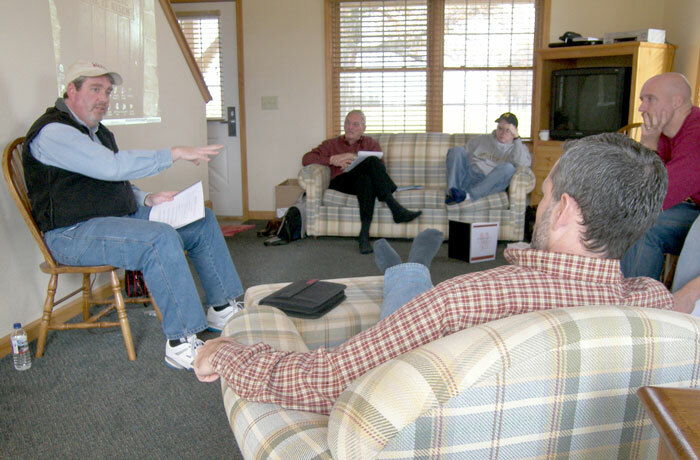 Six UB ministers involved in church planting situations met near Blissfield, Mich., on October 28-29 for two days of learning, encouragement, and fellowship. The event, sponsored by the Church Multiplication Leadership Team and UB Church Multiplication Director Tom Blaylock, was held at two cabins next to The Legacy golf course. Thurm Payton (Lighthouse Community Church, Williamston, Mich.). Cal Hodgson (Heritage UB, Dansville, Mich.). Dalton Jenkins (Bethel Temple of Praise, Yonkers, N.Y.). 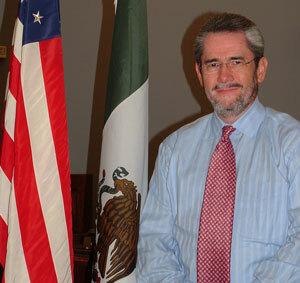 Howard Matthews (Homefront UB, Grandville, Mich.). Bryan Converse (Family Life Church, Maineville, Ohio). Gordon Kettle (soon to be planting a church in Grand Ledge, Mich.). Three other church planters were unable to attend. Also attending were Bishop Ron Ramsey, Healthy Church Director Pat Jones, Global Ministries Director Gary Dilley, Communications Director Steve Dennie, and Bob Ransom of the Missionary Church. 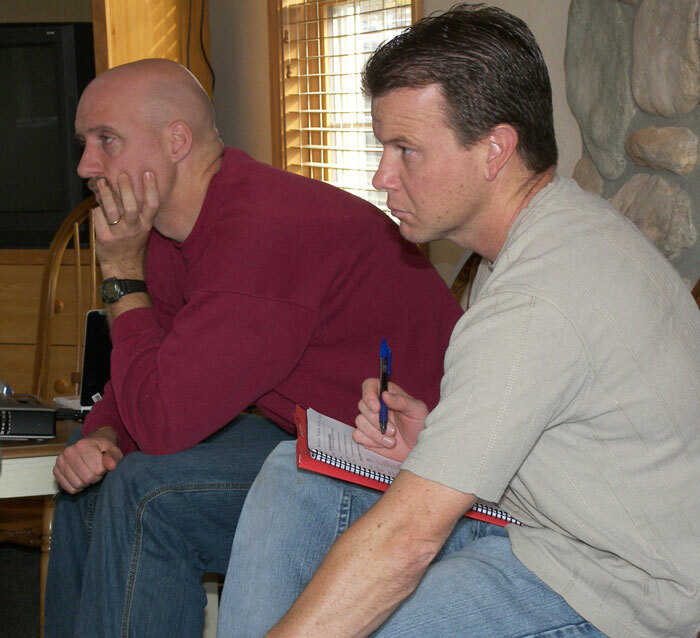 Tim Roehl, who serves in a church planting role with the Evangelical Church, was the resource person. He led everyone through a notebook and presentations which hit various aspects of church planting. Click on the thumbnails below for a larger view of photos from the event. Tim Roehl talking to the group. Cal Hodgson (left) and Tom Blaylock. Bishop Ron Ramsey talking to the group. Gordon Kettle (left) and Dalton Jenkins. 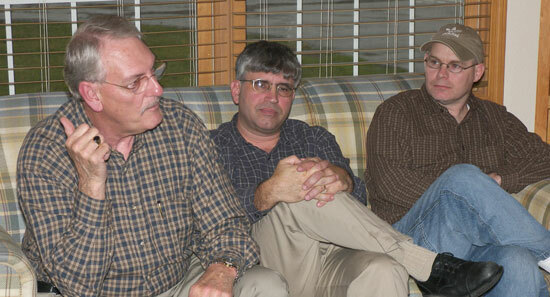 L-r: Tom Blaylock, Thurm Payton, and Cal Hodgson. The group having prayer for Bryan Converse. The city of Findlay, Ohio, recognized Halloween on Thursday, October 26. The First UB church of Findlay organized an outreach during that time. They provided games, face painting, cookies, and treats for the neighborhood children and called it the Pumpkin Patch Party. 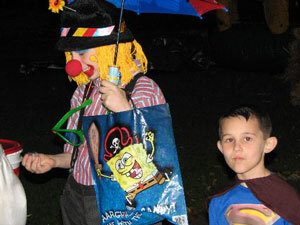 Each child received a bag containing a king-size candy bar, an evangelistic tract, and a church brochure. The children then proceeded to six more stations where they received even more treats. Over 200 neighborhood youth visited the church. To attract more children, the youth group set up a station at a key intersection, where they gave out small candy and said, “Hey, there are huge candy bars down at that church.” Once they set up station, neighborhood people flocked to flock to the church. If the community didn’t know there was a church at the end of the street, they do now. It was a success, because the church people got excited and got involved. The organizer, Jane Mathers, stated, “I heard so many good comments from the neighborhood people.” Darwin Dunten is the pastor of First UB. During its October 2006 meeting, the Executive Leadership Team accepted a new church into the US National Conference: Bethel Temple of Praise in Yonkers, New York. This is a predominantly Jamaican congregation. The pastor and founder of this church, Dalton Jenkins (right), is originally from our UB churches in Jamaica. Kelly Burside is the new senior pastor of Gaines UB (Caledonia, Mich.) effective October 8, 2006. 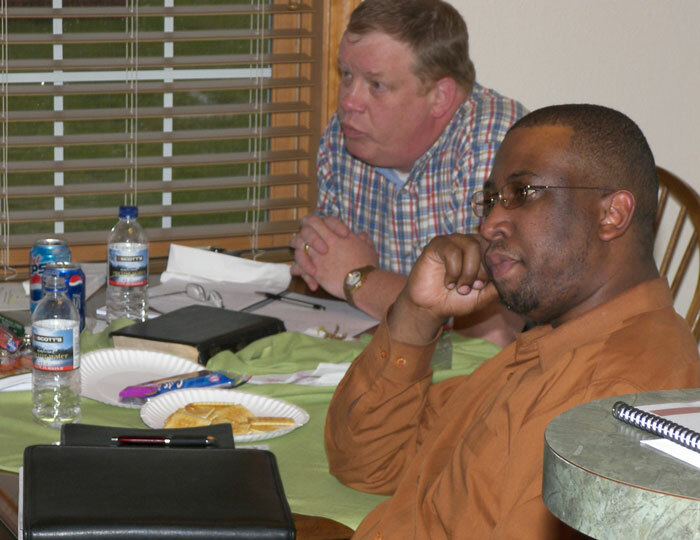 Arthur Page (right, below) will become the new senior pastor of Salem UB (Chambersburg, Pa.) on January 1, 2007. He replaces Ron Cook, who is retiring. Several UB churches continue searching for ministers–in some cases a senior pastor, in others a staff position. Position openings are kept on this page. If your church is in need of a staff position, submit the information here and it will be posted on thle UB website. In the fall of 2004, 42 people who inquired about attending Huntington University also expressed an interest in a Spanish major. The Spanish education program will combine the major in Spanish with the necessary courses required for teacher certification, training students to become high school Spanish teachers. Gary Brooks, a UB minister living in Florida and a former UB missionary in Honduras, accompanied Mexico Conference’s bishop, Denis Casco (right), in conducting a seminar for the UB churches in El Paso, Texas. The conference was held October 13-15. Gary sent this report on October 27. We had 25 students present for the seminars, which were held at the Sembrador Church in El Paso, where Roberto Espinoza is the pastor. Denis Casco and I shared teaching responsibilities on Friday and Saturday. I taught a series from the Gospel of John, concentrating on the last week of Jesus’ ministry on earth, and Denis taught classes on family and marriage relationships. At the conclusion of the seminar, Diplomas of Participation prepared by Denis were given out to the church workers who had attended all four sessions. We had 25 students present for the seminars. Francisco Raudales, superintendent of Honduras National Conference, sent this report on October 16. The link below will take you to some photos from the trip to Sonaguerita. Here is a report from Mt. Olivet UB church in Mt. Solon, Va.: “Our church has been busy with mission projects. In March, Rob and Fonda Cassidy went on a medical team project led by Donna Hollopeter in Honduras. In July, a large group was involved in a work project at Laurel Mission in Kentucky. And in September, the Cassidys were back in Bolivia on a surgical team working in the area of Santa Cruz. 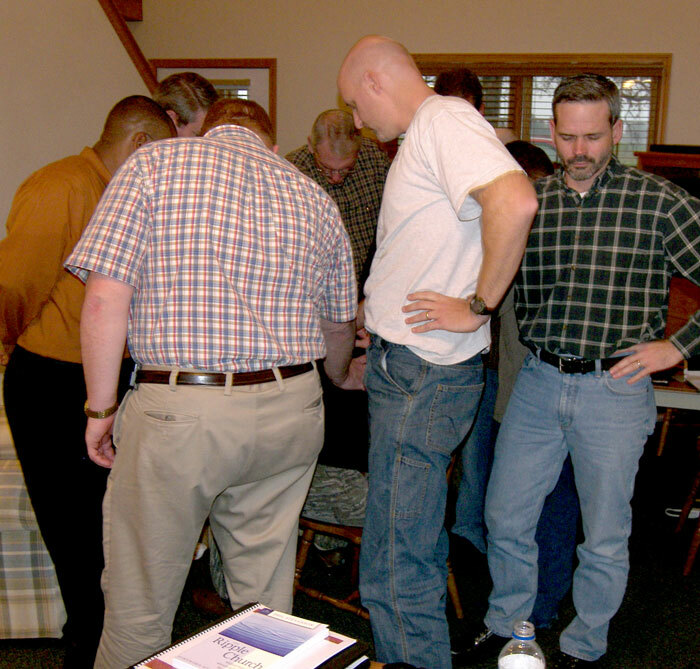 Jason Hollopeter (standing in the doorway) with one of the groups of pastors he taught. Jason Hollopeter, pastor of the UB church in Corunna, Ind., spent a week teaching a basic theology course to pastors in Honduras. He did this in two places: for 40-45 pastors in La Ceiba, and then for 15-18 pastors in the Copan region of Honduras. This is a course which Honduran pastors need for their licensing and ordination, as was done through the conference’s theological institute. 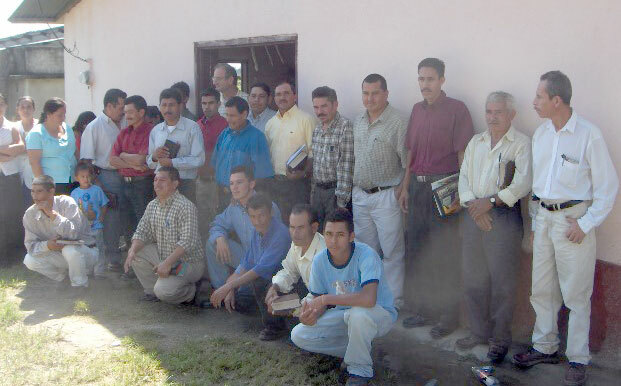 In addition, 29 Honduran pastors participated in a continuing education study on 1 John. Buddy Mullins will present a concert on Sunday, October 22, at the Lake View UB church of Camden, Mich. The concert will be held at 2:30 in the afternoon. For directions, go to the church website. You can also call the church at: (517) 567-8529. Buddy has a rich heritage in Christian music. His father was a traveling evangelist who traveled with the Gaither Vocal Band in the early 1990s and also participated in Gaither Homecoming events. We are preparing to send a container of materials to Sierra Leone, West Africa. Here are some items which would be of great value to our Sierra Leoneans brothers and sisters. Musical Instruments. As we come along side the churches of Sierra Leone, West Africa, and particularly the young people, one of the greatest blessings we can provide them is access to musical instruments for their churches–keyboards, guitars and drums. As they look toward outreach, church planting, as well as worship in existing congregations, the gift of music is highly desired. As churches (and homes) here in North America replace and upgrade keyboards, perhaps there are instruments you can contribute for God’s glory. Do you have guitars or drum sets in good condition that are now just sitting at rest? Let us know! Robes and Hymnals. African churches are also very interested in good choir robes that our North American churches are no longer using, as well as United Brethren hymnals that may be sitting unused in a closet in your church. If you have any items to donate, please contact Global Ministries by December 1. You can email us or call Darlene Burkett with our toll-free number: 1-888-622-3019. Donations will not be accepted after December 1.